The work of building the walls of Jerusalem is but a shadow of the work of the Spirit protecting us in spiritual warfare, protecting us from the enemy (c.f. Ephesians 6). It is strange that such an apparently defeated nation as Israel should pose such a threat to the Samarians, Arabians and Ashdodites (Ashdod being one of the cities of the Philistines assigned to Judah (Joshua 15:47) but never subdued), in particular Sanballat and Tobiah, the picture of Moab and Ammon plotting together to fight against Jerusalem and causing confusion (v.8; c.f. 2 Chronicles 20), which is but seen by God as a joint council to break the bond between the Father and the Son (Psalm 2). Not unlike the fear of the majority of the spies at Jericho (Numbers 14), the men of Judah in the midst of their persecution have need to turn to Nehemiah who reminds them of the “great and awesome” Lord (v.14). Nehemiah acts as the typological Christ, comforting us in our persecutions whilst pronouncing judgment on those who stand outside of Israel (v.4-5), a picture of judgment on those standing outside of spiritual Israel (Romans 11). Immediately upon Nehemiah’s encouragement, v.15 emphasises that “God had frustrated their [the enemies’] plan”. It is important for us to learn from the subsequent verses the life of the church – “half of my servants worked on construction, and half held the spears, shields, bows, and coats of mail. And the leaders stood behind the whole house of Judah, who were building on the wall” (v.16-17). This continued even untilt he stars came out (v.21), guarding by night and labouring by day (v.22), such persistence of faith (1 Timothy 6:12) fuelled by the “great and awesome” Lord, by His steadfast faithfulness (Nehemiah 1:5) rather than the faithfulness (or lack thereof!) of the men of Judah. This is again emphasised by the trumpet call – for although each had their own ministries, the call (Revelation 1:10, 4:1, 8:7-12, 9:1-14, 10:7, 11:15) shall bring the scattered Israelites together again – a picture of the global Church fighting their own fights against the enemy in their respective ministries, but the Day when Christ returns is the same Day when we gather but not to fight with our own might. Rather, God will fight for us (v.20). V.1-13 almost track the story of Zacchaeus, the tax collector exactly (see especially Luke 19). The domino effect of the famine and the interest to manage one’s wealth selfishly was despicable in the eyes of Nehemiah – such enslavement to the state not a result of the famine or the king but a result of the Israelites’ decision to subject themselves to such enslavement rather than relish in the freedom from Babylonian captivity and continue to live under such freedom. The question Nehemiah posed is key – “The thing that you are doing is not good. Ought you not to walk in the fear of our God to prevent the taunts of the nations our enemies?”. We ought to – and we ought even to display a community of shared wealth (c.f. Acts 5:3) just as Christ displayed the greatest Trinitarian community of shared glory (John 17), shaking out those (v.13) who preach a false gospel of Unitarian theology. Thus, Nehemiah’s life testimony is a witness to the fear of God (v.15) despite the hard times falling on the Israelites – all the while continuing with the work on the wall, a reminder that we should never sway from our set goal of new creation despite worldly circumstances, just as Christ never swayed from his goal of redemption despite the tempting of the enemy (Mark 1). Yet, the highlight was not the work – but the nourishment of the Jews and the officials (which, I expect, to include the very officials enforcing the food allowance of the governor) as an act of loving his enemies – a precept so clear to Nehemiah taught by God’s faithfulness (v.19). This is the freedom preached by Nehemiah (Galatians 3-5). Yet, the persecution continues in v.1-14. Though true that there is a king in Judah (v.7), Nehemiah clarifies that no such thing is done (v.8) – for the “rebellion” and “kingship” does not lie in Nehemiah’s leadership – but in the One he worships. This is identified ever so clearly in his refusal to hide in the temple, the Holy Place (v.11), in order to embrace the precepts which Ezra so painstakingly laid down in the previous book. Even on appearance, Shemaiah the prophet, Noadiah the prophetess and the rest of the prophets could not deceive Nehemiah who “understood and saw” that God had not sent them for they preach fear rather than freedom – such insight and perception only capable with the Holy Spirit (c.f. Luke 5:22). Finally, the wall is complete on the 25th day of Elul, which means the building began in the month of Av and ended in the month of preparation for the Day of Atonement and Day of Judgment – symbolised quaintly by the blowing of the trumpet to announce the return of Christ. Even the enemies saw that the walls of Jerusalem, the walls and the Body of the Ancient Church, were completed only with the help of God. Although Tobiah’s stature placed him in a position to ridicule and humble Nehemiah, Nehemiah’s reliance and comfort has not ceased to be on or from Christ, the true builder of the global Church. In Ezra, we see the heart of man being circumcised as the law is written on the hearts of those who now return from the long exile. Nehemiah builds on this rebirth by looking at Ezra’s work from the outside, the cupbearer who identified with the Church – weeping and mourning for days, fasting and praying before the LORD (v.4), repeating the refrain (c.f. 2 Chronicles 7) that the LORD is the one who keeps covenant and steadfast love with those who love him and keep his commandments. Nehemiah immediately is the mediator, the intercessor on behalf of the church, understanding the work of the Mediator – the Christ who is also the Comforter, the name which “Nehemiah” matches. He recognises that even in Egypt, it is the LORD who saved first before we became His servants (v.10 – they are your servants and your people, who you have redeemed by your great power and by your strong hand). So Nehemiah, the Comforting Intercessor and type of Christ the Mediator, stands before the king whilst his heart yearns for the church whom he is very much part of despite the geographical limitations. Nehemiah begins immediately with the sickness of his heart – sickness for the rebuilding and the reformation of the Ancient Church. Yet, the LORD’s hand was with him (v.8), that even Artaxerxes should provide materials for the meek to inherit (Psalm 37:11; Matthew 5:5) and to build the gates of the fortress of the temple and for the wall of the city and for the house that he shall occupy. Such timber is not provided by the Israelites themselves, but through Artaxerxes’ resources by the grace of God. From hearing the news of the destruction of the walls of Jerusalem where the laws are being written on the hearts of tender souls young in their rebirth upon returning from decades of exile, Nehemiah was there three days to rebuild the walls (c.f. symbolism of the third day when Christ resurrected). This is a very different story to Ezra who built the heart mind and soul of the Israelite; whereas Nehemiah built the foundation and the armour protecting the Israelites’ from external onslaught, the spiritual warfare realised on a national level (c.f. Ephesians 6:10-20). (i) the Valley Gate, then (ii) to the Dragon Spring, then (iii) to the Dung Gate, then (iv) inspected the walls of Jerusalem (v.13). This is followed by (v) the Fountain Gate and (vi) to the King’s Pool (where there was no room for the animal to pass and (viii) inspected the wall and (ix) turned back and entered by the Valley Gate. These various steps are meaningless to the officials, yet v.17-20 reveals all: Nehemiah intends to remove Jerusalem of its derision and that the LORD will make the Ancient Church prosper (v.20) in face of difficult persecution. Yet, for all who jeer at the work the Lord has tasked us (v.19), they would have no portion or right or claim in Jerusalem (v.20). Are you rebelling against the earthly king? Or are you fulfilling the command of the One King, the Lord of Lords, to plead the protection of your heart? 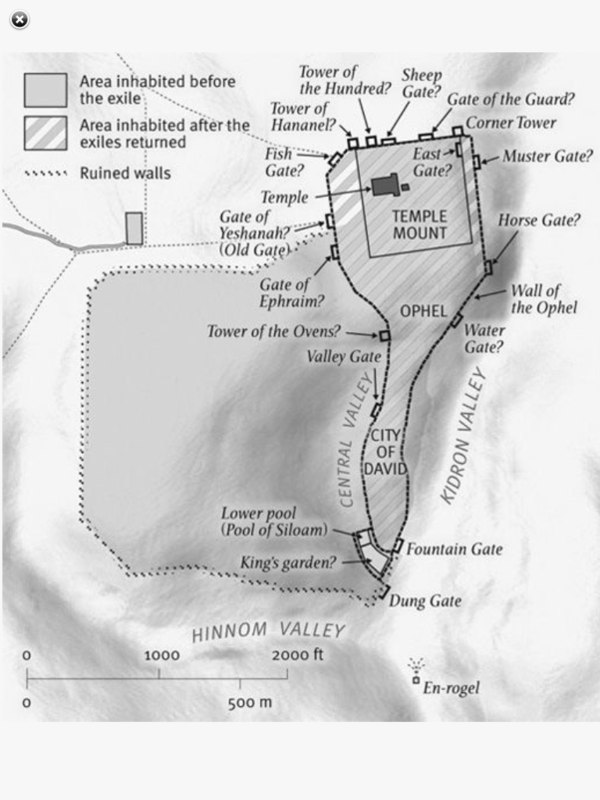 Note however have Nehemiah only visits the southern part of the wall – the furthest part from the Temple. Incidentally the area he visits is where the brook Kidron is, commonly associated to weeping and cleansing throughout Scripture (see 2 Samuel 15:23; 1 Kings 2:37; 1 Kings 15:13; 2 Kings 23:4-12; 2 Chronicles 15:16; 2 Chronicles 29:16; 2 Chronicles 30:14; Jeremiah 31:40 and finally John 18:1, where Christ was betrayed). It is here that Nehemiah recalls the pain and suffering Israel had undergone as a refinery of the nation’s faith in Christ, that through this brook are our sins cleansed entirely and completely renewed as represented by the rebuilding of the wall of Jerusalem. To this, we turn to chapter 3 where the rebuilding begins and portrays with even more clarity how such cleansing is brought about through Nehemiah’s plan which is but a shadow of God’s plan of global redemption. Then finally returning to the Sheep Gate (v.32) – as the Lamb is the Alpha (the first gate), so also the completion of the Muster Gate returns to the Omega – which is also the Sheep Gate, the Passover Lamb.